Manage Comics’ Shipping Rates allow you to apply different rates to different areas. All shipping is based on the dollar amount of a package, and not on weight at this time. 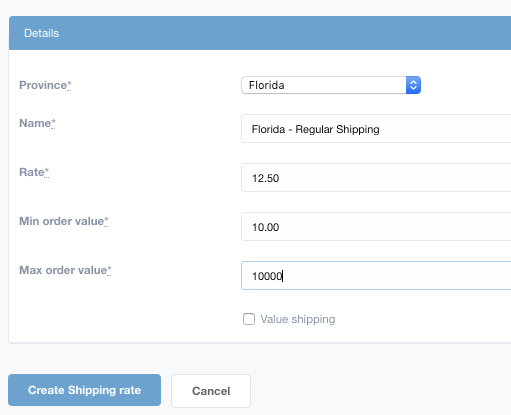 Select the State or Province that you want to set the shipping rate for. Add a rate (in dollars). Setting a minimum and maximum value allows you to set different thresholds, for example if you want to have a $10 flat rate, and free shipping over $50, you would set a rate of $10 for orders between $0.00 – $49.99 and another rate of $0 for orders between $50 – $10000.